Steve and I were invited to be guests of Prince Louis Albert de Broglie on his property in the Loire Valley of France to talk about the sustainable food movement. Our group also included Lori and Chef Michel Nischan (owner of the renowned restaurant Dressing Room, in Westport, CT and President/CEO of Wholesome Wave) and two other couples. Our destination, the captivating Chateau de la Bourdaisière in Touraine, is owned by Prince Louis and his wife, Princess Françoise. He is known as le prince jardinier (the prince gardener) for his love of growing fruits and vegetables. The Chateau, with its National Conservancy of Tomatoes (boasting 650+ varieties and an annual tomato festival!) and historical vegetable and medicinal gardens, has become a destination for visitors. 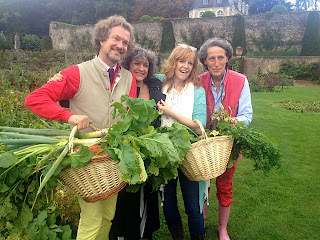 We were guests at the Chateau for three glorious days of gardening, cooking, and talking about changes happening and needed in the sustainable food movement. Our purpose for going and the subsequent discussions made for a wholly enlightening experience. 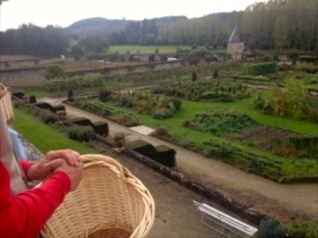 Some time ago, Prince Louis recognized his country was experiencing the loss of heirloom varieties and set out to address the issue, establishing the Conservancy and historical gardens at the Chateau. The Prince’s passion is one we see in Paige and Justin of Serenbe Farms and Rebecca and Ross of Many Fold Farm. It was exciting to be part of discussions which serve to strengthen connections among passionate people around the world. Though Chef Michel and I were the guests with professional cooking experience, wonderfully, we all participated in preparing fresh-from-the-garden meals shared family style. 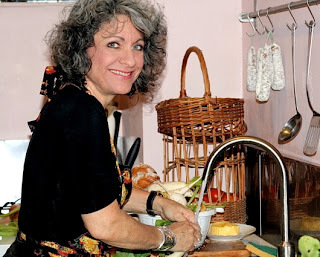 Michel assigned duties in the kitchen, and, over glasses of wine and amid stimulating conversation, we worked communally to prepare delicious, wholesome meals. This was a memorable coming together of interesting people and demonstrated what I’ve known all my life – food connects us. Whether dining in a 15th century French castle or at one’s dining room table, it’s the interactions we have with one another and with the food nourishing us that bring joy and meaning to our lives.